Suddenly I saw a dragonfly zip by and I called out, “Hello there!” Just then he circled back around and landed on the front of my shorts. Just as I was trying to figure out how I was going to take a picture at this angle my daughter walked out the door. I quietly summoned her over to take the picture before the dragonfly made his move, which he did and flew onto the side of the house. This was a much better angle for picture taking, we got two clear shots. 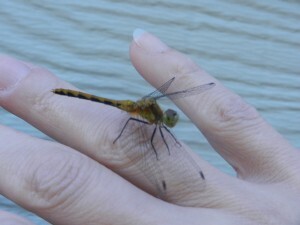 I saw the dragonfly move his head in an upward motion just before he lifted off again and then landed on my hand. I said, “Look I am wearing a dragonfly ring.” My daughter giggled and said as she focused in for a picture, “People won’t believe this; they will think it is photo shopped!” I quickly replied, “But we know it is real and it did happen.” She happily agreed.